World's biggest brewers to merge? 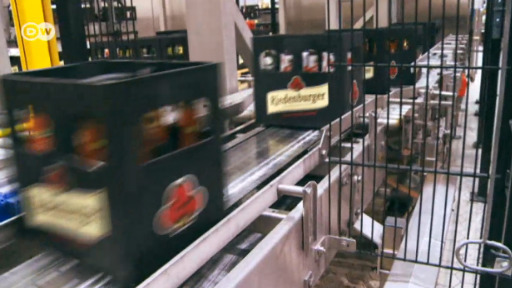 Beer and soft drink maker Anheuser-Busch InBev wants to take over rival SABMiller from the UK. Should the deal come about, the two companies would control no less than a third of the global beer market. Anheuser-Busch InBev, the world's biggest beer maker, approached rival SABMiller about a takeover, the two companies confirmed Wednesday. A merged group would have a combined market value of around $270 billion (240 billion euros), based on current prices. It would combine AB InBev's dominance of Latin America with SABMiller's strong presence in Africa, both fast-growing markets, as well as strengthen their position in Asia. Britain-based SABMiller, the world's No. 2 brewer, said on Wednesday that it had been informed by its bigger Belgian rival that it intended to make a takeover bid, but it did not have any further information about the terms. "The board of SABMiller will review and respond as appropriate to any proposal which might be made," it said. "There can be no certainty that an offer will be made or as to the terms on which any offer might be made." AB InBev responded by confirming its approach to SABMiller's board. "AB InBev's intention is to work with SABMiller's board toward a recommended transaction." Shares in SAB, which owns such brands as Peroni, Grolsch and Pilsner Urquell, were up more than 20 percent. Anheuser-Busch InBev, which has Budweiser, Stella Artois and Corona, saw its shares jump 7 percent before trading was suspended. There has been speculation of such a mega-merger for years, with the global beer market being increasingly dominated by big multinationals. One key area of concern to regulators would be the combined group's market share in the United States, where AB InBev controls almost half the market and SABMiller's joint venture with Molson Coors just under 30 percent. In Bavaria, one brewery has been making organic beer for decades. Revenue from organic products has increased fivefold since 2000, to over €10 billion per year.